Last week, we had the pleasure of attending The Yellow Conference as part of The Good Trade team. The Yellow Conference is an annual event, bringing together 500 female creatives interested in doing social good. We were thrilled to be meeting like-minded women who were on a mission to make an impact on the world, and was even more excited to hear we’d be covering lesser-discussed topics like self-care, overcoming mental blocks, and activism in our everyday lives. So, on August 24th, we showed up ready to learn and be inspired. And let me tell you, what an experience. Everything was so beautifully curated and designed from their Yellow goody bags (eco-friendly ones of course) with dozens of ethically-made products, to their Do Good Marketplace featuring ethical brands like Hiptipico and Parker Clay. But what we loved most were their diverse speakers and informative talks. We came away with 5 key takeaways that will be resonating with our team for the rest of this year to say the least. When Golriz Lucina, Head of Creative at SoulPancake, shared her top lessons for “creativity as a party of one”, they included embracing your constraints, banishing naysayers, and knowing that your weirdest ideas may be your best ideas. But the one that most resonated with us was to never underestimate the gut check. If she didn’t trust her gut, they would have never released The Last Days, a powerful TV series with Justin Baldoni about those living while knowing they are dying. Especially in the world of do-good marketing and storytelling, our gut check is one of the most powerful tools we have. Needless to say, we were pretty pumped to hear from our favorite nonprofit, Krochet Kids, and their co-founder Kohl Greyson. Sometimes we spend so much time storytelling and writing communications that we forget about the people on the ground doing the work, despite the entire premise of our work. While Kohl empathized finding what you’re good at and making an impact with those skill sets, Krochet Kids aims to humanize the apparel industry, infusing humanity and life into being global citizens. It's so important to share stories and perspectives that make us all better global citizens, engaged in a lifestyle of giving back and empowering others. But, we need to be mindful of being exploitative or coming from the 'savior complex'. Empowerment is about so much more than that, and building the relationship between the consumers + makers is an integral piece of that. We have watched Natalie Warne’s TED Talk about her work with Invisible Children (and Oprah!) more than one or two times, and we were especially fan-girling when Natalie took the stage. Her story was incredibly moving and powerful, and she highlighted the fact that we always teach people that they have to do something, but we don’t teach them what or how. As an activist, she trains others in advocacy work, explaining that advocacy is not a trait we’re all born with; it’s a muscle we need to exercise over and over again. But we need to incorporate advocacy as a lifestyle change, not necessarily just in the big moments. 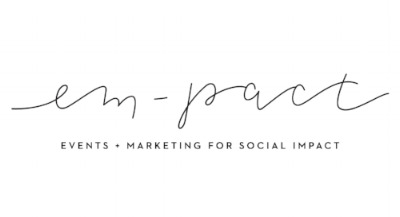 The power of implementing social change isn’t just in the hands of politicians and the 1%, it includes all of us as communities, organizers, business owners, and especially in the work of em-pact itself. WHO ARE WE + HOW DOES THAT CREATE CHANGE? Perhaps the most influential talk for us was entrepreneur + writer Holley Murchison’s - she truly made us distill who we are from what we do, and how to use our purpose. She is a beautiful + articulate speaker who gave us chills: "You have to exist fully and freely in all that you are. All those moving parts, your values, your beliefs - that's who you are. It informs what you are about and what you'll contribute." After these 2 days, we walked away feeling energized and ready to make a more intentional difference utilizing these lessons. We’re already planning on returning to the Yellow Conference for 2018 - will you be joining us?